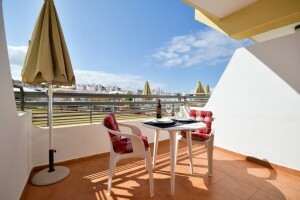 Holiday accommodation in Santa Maria complex in Costa Adeje Tenerife. Many with sea and pool views. We are proud to announce that this ground floor studio on Santa Maria has just been refurbished with a new bathroom and a new kitchen. Click on the link above to see the new photos, which have been taking professionally. The apartment has air conditioning as well as ceiling fans in the bedroom and living areas. There is a new sofa bed and satellite TV with English channels. A special and highly recommended restaurant in Tenerife. The Molina Blanco Restaurant is situated in San Eugenio Alto close to Aqualand. The word in Spanish means “white windmill”, which is just what you will find at the entrance to the restaurant. For hundreds of years the staple food in the Canary Islands was gofio which is a flour which would have been milled in windmills such as the one at the Molino Blanco restaurant. Today few of these windmills survive. 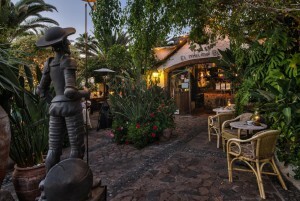 It was relevant for Don Felipo, who founded the restaurant in the 1990s, as the windmill represents tradition in the Canaries. The restaurant is consists of an indoor dining room and a garden terrace. But this is not just a restaurant, as it also offers a side order of entertainment, featuring live music in a romantic ambiance. The top quality menu is made up of a mixture of traditional Canarian and international dishes. The chef uses fresh seasonal produce including fish, meat, vegetables and fruit. The cuisine is traditional done really well, rather than being a challenging alternative to what our palates expect. It isn’t too expensive either, with main courses averaging at 20 euros and starters for 12 euros. You can pay less than 100 euros for 3 courses and a bottle of wine for 2 people.